Sega is still a key player in today's video game industry, but its position has diminished considerably over the past few decades. 25 years ago, it was one of the undisputed giants not only of the gaming arena, but of mainstream popular culture, having successfully taken on Nintendo with its popular Mega Drive / Genesis and made a global star of its cool mascot, Sonic the Hedgehog. 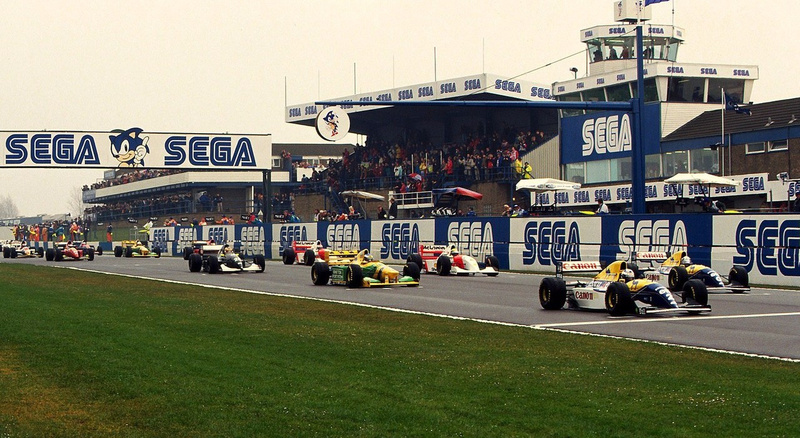 Sonic turns 25 this year, and now is as good a time as any to look back on an event which illustrated just how enormous Sega was at the time: the 1993 Formula One European Grand Prix, or - to use its official name - the XXXVIII Sega European Grand Prix. That's right - Sega spent big on the race weekend and even went as far as securing naming rights for the race. Held at the UK circuit of Donington Park (a short drive from the Nintendo Life offices, coincidentally) on 11th April 1993, the race can be considered the culmination of Sega's intense marketing blitz at the time. The Japanese firm had already paid a handsome amount of cash to become a headline sponsor for the Williams F1 team, who were expected to claim victory that season despite the departure of the talismanic Nigel Mansell for the American CART IndyCar (now known as Champ Car) series. Mansell had scooped his one and only F1 championship in the previous season and would secure the CART title in his rookie season, making him the only person to hold both the F1 World Drivers Championship and the American open-wheel National Championship at the same time. The Williams-Renault FW15C was basically a Sega advertisement with an average speed of 150 mph. Logos could be seen all over the bodywork, and on the side of the cockpit there was even a fake "cutaway" section which showed Sonic's feet where the driver's should be. 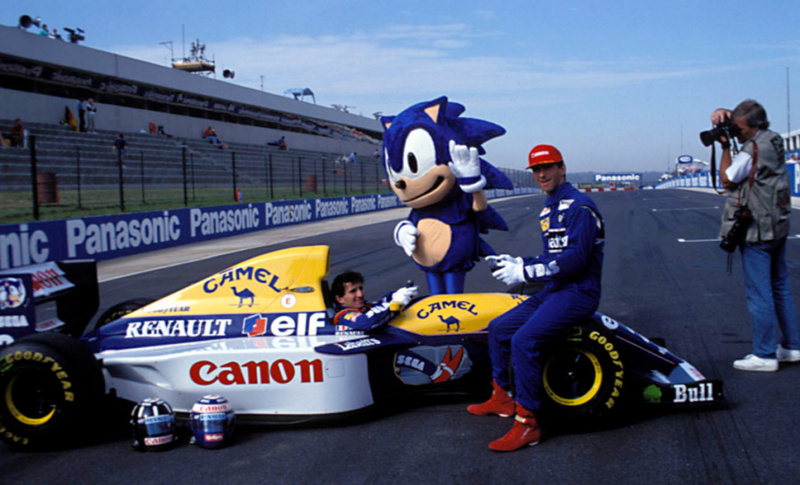 Williams teammates Damon Hill and Alain Prost were - amongst other things - contractually obliged to appear in promotional photos with Sonic whilst playing Game Gear consoles. 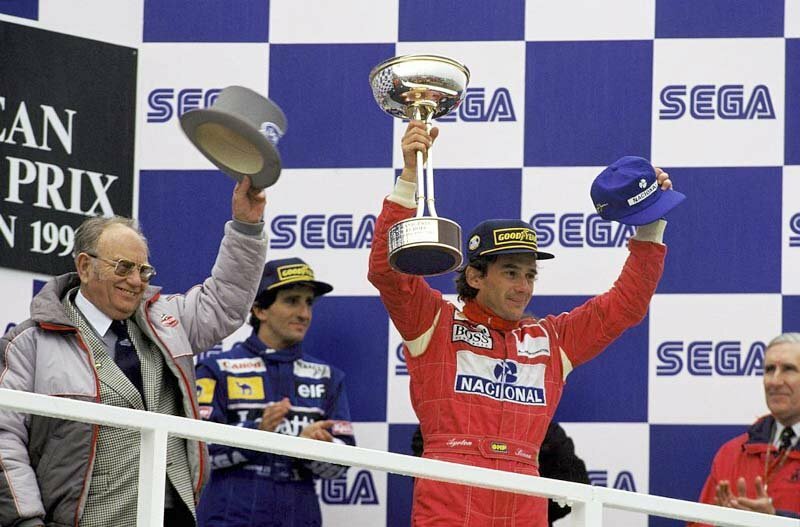 It was proof how just how far video games had invaded popular culture, but for seasoned gamers and Sega fans, it felt like a solid match - after all, Sega had produced the excellent Super Monaco GP and Super Monaco GP 2, the latter of which featured the endorsement of three-time world champion Ayrton Senna - who, incidentally, would claim victory at Donington Park that weekend. The race itself was a remarkable event, with Senna driving what many pundits regard as the greatest lap ever in an F1 car. 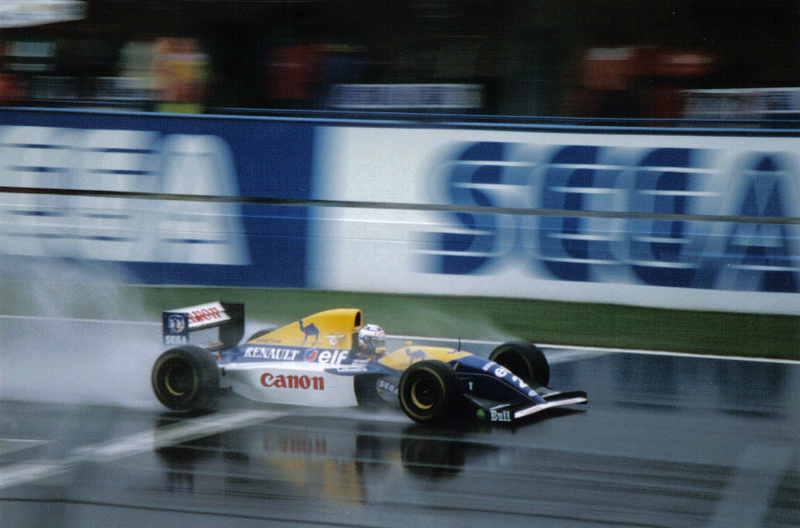 With the typically wet British weather reducing grip and hampering visibility, Senna overtook four other cars on this first lap alone - his wet-weather skills being showcased in dramatic fashion. Senna's rather underpowered McLaren Ford MP4/8 was notably inferior to the cutting-edge Williams-Renault FW15C, yet he managed to lap the entire field except for one car and finished the race over a minute ahead of the second place challenger, Damon Hill. It was one of the most accomplished performances of Senna's glittering career. 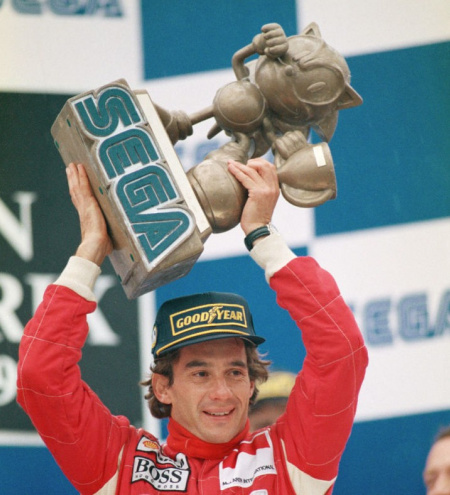 During the race, Sega's logo could be seen everywhere, from advertising hoardings to the podium backdrop, where Senna was photographed holding aloft a Sonic the Hedgehog trophy at the end of the race. This image has gone down in motorsport (and gaming) folklore, and given the incredible amount of exposure Sega secured during the weekend, one could be forgiven for assuming that the video game giant simply paid to have a unique official rare trophy made to commemorate the win. 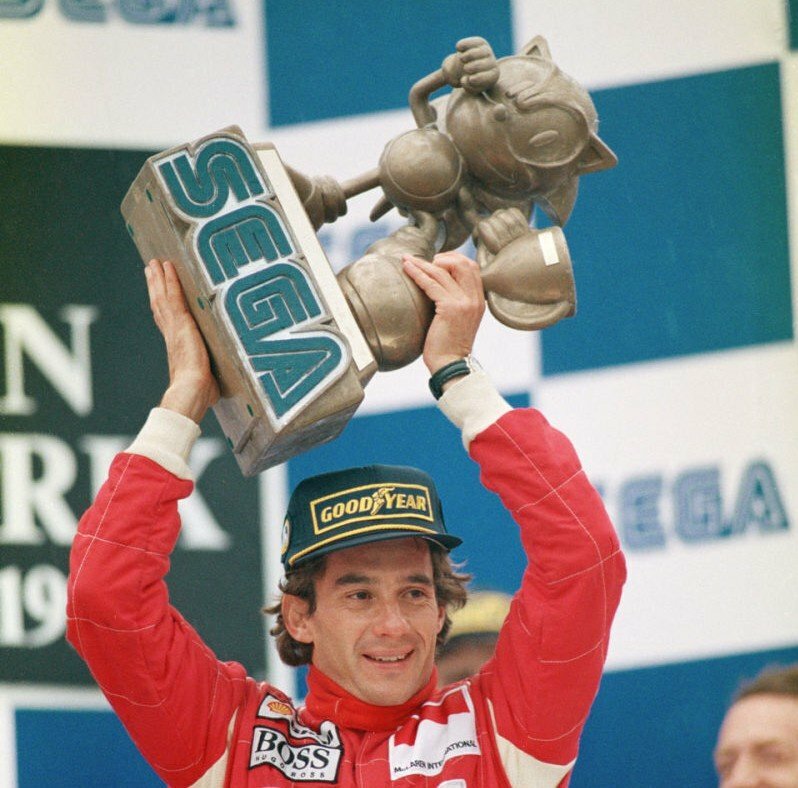 However, the truth is a little more mundane; The Sonic trophy was merely for promotional purposes, and Senna was handed the real race trophy shortly afterwards. 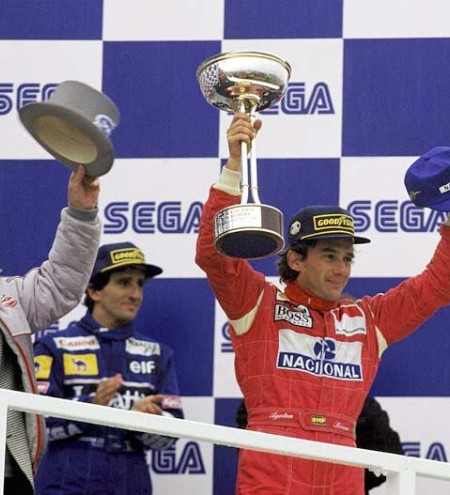 Senna would leave McLaren - where he scored all three of his championships - to drive for Williams the following year, but without Sega's overbearing sponsorship (ironically, the sponsor which would effectively replace Sega was Italian Espresso producer Segafredo Zanetti). The Brazilian regarded the team as his best chance to claim his fourth world championship, but he was tragically killed at the 1994 San Marino Grand Prix following a 145 mph collision with a concrete retaining wall. Widely respected and admired during his life, he is now regarded as one of the best drivers the sport has ever seen, and was the subject of the 2010 BAFTA-winning documentary Senna - which is well worth a watch even if you're not interested in F1. On the left, the legendary Sonic trophy. On the right, Senna is handed the real race trophy. Sega's fortunes following the 1993 season were mixed. In the video game realm 1994 was another successful year for its 16-bit platform, but the release of add-ons like the Mega CD and 32X dented consumer confidence in the brand, and the launch of the 32-bit Saturn was overshadowed by Sony's entry into the video game arena with its phenomenally successful PlayStation console. I've seen video of that, and it's unbelieveable. All the starters wearing Sonic costumes, Sega everywhere - that would have cost millions of pounds. Sega would dabble in sponsorship a few years later, putting its logo - and that of the Dreamcast console - on the shirt of the Premier League football club Arsenal (as well as several other teams around the world) but the ridiculously grand-sounding XXXVIII Sega European Grand Prix is surely the defining moment in the firm's promotional adventures. I could see that promotional trophy going for big money to a collector. It looks cool. Such a cool moment in video game history. It's always fun when video games cross over with sports in real life. The GameStop NASCAR that races in the Xfinity series and the Nintendo owned Seattle Mariners are some current examples of this. Sega and Formula1: two things that are shells of their former selves. I miss the days when video games companies would be used as sponsors. I remember the Dreamcast sponsor of Arsenal. Sega also had a huge Sonic the Hedgehog Hot Air Balloon in the 90s, which would take off annually at the Bristol International Balloon Fiesta (and many others I'm sure). Seeing as that was held just a few miles from my house, I would often see Sonic fly past my window every summer - which was awesome since I was a huge Sonic fan. Damn, I miss seeing that thing. As a follower of F1 since the early 80's when it was becoming televised internationally and about when Senna's F1 career began, I was reminded since his passing in 1994 the Donington race of 1993 was one of his best efforts. But amazingly, this is the first time I have heard it called the Sega Grand Prix of Europe. Sega must be nuts to not have banged on about this connection since then, as its a legendary thing. @kenzo Same here, I'd not heard of the Sega sponsorship (though I may have done at the time and not paid much attention). Although the branding is around the start/finish line, it's not particularly prominent going by that video, and the Sega branding on the Williams cars is easy to miss unless you're looking for it. Hope they didn't pay too much money for it. @Nintendo_Ninja I didn't know Nintendo owned the Seattle Mariners. If only Sega put as much money, resources and effort into their games and consoles as they did with their marketing, maybe they wouldn't have screwed up with the Sega CD, X32 and Saturn. The Dreamcast is actually a good system, so I don't have anything negative to say. Just a pity Sega were near bankrupt at the time. Another thing too about Sega sponsorship of the 1993 Williams Grand Prix Team. Firstly, they got in and out at the right time as Williams won the F1 championship that year. I've always followed indycar more than F1 so I never knew about this but it's pretty cool. How heavy is the SEGA trophy? The bottom looks like solid stone. Good thing it didn't fall on Senna's head and kill him then and there. Contributing factor into their downfall. Needless overspending. This makes me want to go back and play Nigel Mansell World Championship Racing, on the SNES. What a great game that was. I think we still have one of the Super Monaco GP games. II I think. It's telling that online betting is basically the only industry that can afford to sponsor anything big now. Takes away some of the shine of these sports in my eyes. Just another reminder of the insane sums involved, and the kids running around with inappropriately seedy companies on their merchandise t shirts...something is a little off. He looks more happy to have the real trophy. I would be more happy to have the Sega trophy. @FragRed Sega put plenty of money into its systems and games. Some would say they spent too much money in that way. The Saturn, as much as I love it, has way more going on inside than it should. Sega would have been far better off if Sega of America, Sega of Europe and Sega of Japan realized they were allies and not competitors. Formula One Management shut down the youtube video you guys put up unfortunately. Awesome article tho Damien. Thank you for this tid-bit of history! My father used to be one of his main financial advisers back in the days. I have countless autographs, pictures, hats of him. I could easily sell these amazing original signed pictures, as the last one I have seen from another seller (not even a good one), went for 4000 USD on ebay, and it was not even 1/10th as amazing as the ones I have (him sitting in the car wearing helmet looking at the lap times on the tv), etc... I would NEVER sell these, because this man was an incredible person. He loved helping out others in need, he did a lot of charity work, and helped the youth in general back in Brazil. My father asked him once, why he doesn't want to quit F1. He now has it all, the danger is just too dangerous, why not quit? Senna answered, "I can't". Um abraco do meu pai o Roger! Wheres Super Monaco 3d for 3ds? I need it! Oh! I thought it meant "lifted," as in stolen. @Vineleaf Why is that? Both are doing just fine to me.